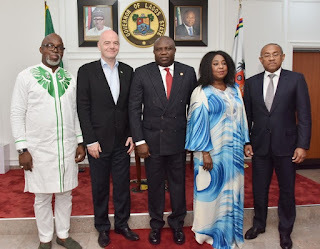 The new FIFA President, Gianni Infantino has paid the Governor of Lagos State, Akinwumi Ambode a visit at the Lagos House, Alausa, Ikeja, on Monday, February 19, 2018. 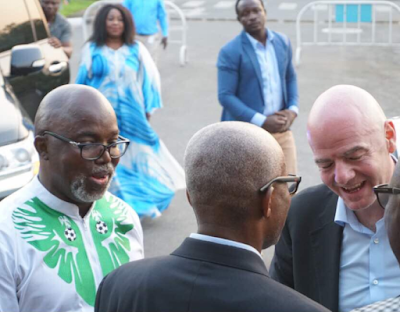 The FIFA president was accompanied by the President of Nigeria Football Federation, Amaju Pinnick and a host of others. 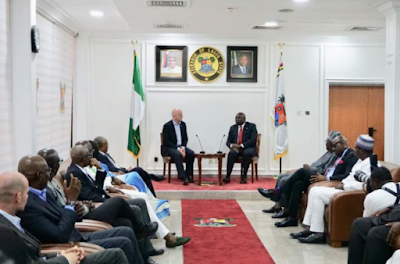 The governor discussed with him on the efforts put in place by the State towards football, especially youths and female football. He also thanked Infantino on having Justice Ayorinde Phillips as a member of the Ethics Committee of FIFA. In return, the FIFA President thanked the Governor for having him and his team in Lagos for the FIFA Executive Football Summit. The FIFA Executive Football Summit holds today at the Eko Hotels and Suites, Victoria Island. Apart from the FIFA President, others who will be in attendance are CAF President Ahmad, FIFA Secretary General Fatma Samoura, FIFA Council members Kwesi Nyantakyi of Ghana and Sonia Bien Aime from Turks and Caicos Islands etc. 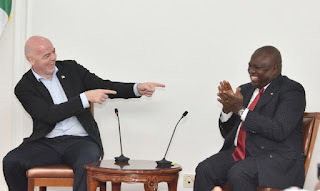 Presidents of the association of the following countries will also be present for the event: Mauritius, Namibia, Lesotho, South Sudan, Sweden, Denmark, Somalia, Swaziland, Grenada, Dominican Republic, Guyana, Turks and Caicos Islands, FYR Macedonia, Lithuania, and San Marino. 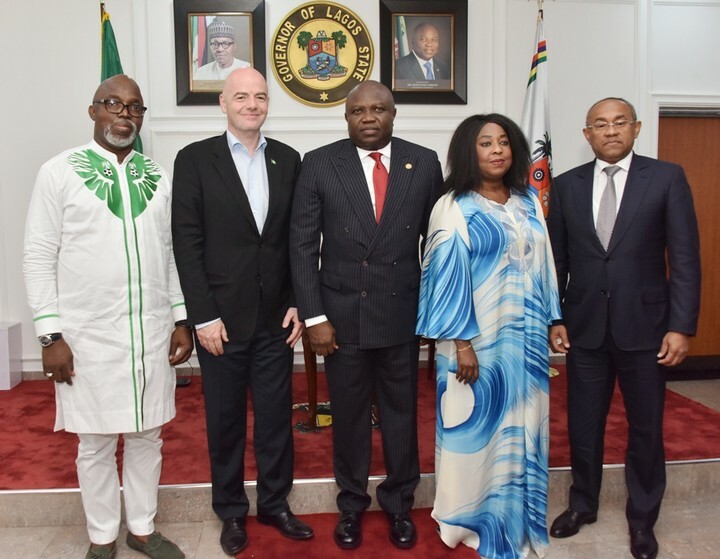 Nigeria was picked to be one of the host of the 12 FIFA Executive Football Summit meetings happening between November 2017 and March 2018. The event is usually held to bring FIFA back to football and football back to FIFA. This is all done in preparation for next year’s world cup holding in Russia. Nigeria is placed in group D alongside Argentina, Iceland and Croatia. The home and away jerseys the Super Eagles will be wearing for the competition have been launched in London with players like, Alex Iwobi, Kelechi Iheanacho etc present.